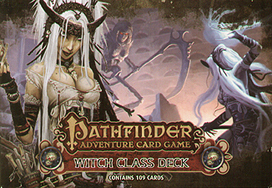 Curse and jinx your way through any Pathfinder Adventure Card Game Base Set with the Pathfinder Adventure Card Game Witch Deck Three new characters and a cauldron full of new spells, items, and familiars make up this exciting 109-card set that will support your witch all the way through any Adventure Path. or Pathfinder Society Adventure Card Guild organized play campaign. With the Witch Deck, sweet vengeance is only a die roll away. This deck is not a standalone game. It is an accessory for use with any Pathfinder Adventure Card Game Base Set.